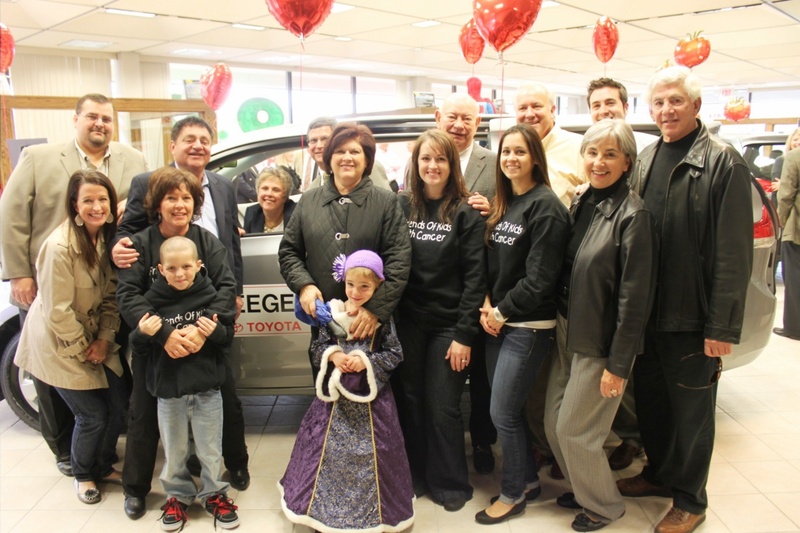 Friends of Kids with Cancer and Operation Food Search were honored by Seeger Toyota Scion in a small celebration on Wednesday, November 9th at their showroom on Olive Blvd. Friends and Operation Food Search were named winners in Toyota's 100 Cars for Good Program this past summer. Both organizations were awarded a brand new Toyota Sienna van and a donation of $5,000 from Seeger and the Toyota Corporation. Additionally, Seeger held a toy and canned food drive throughout the month of November to fill the vans with the items that both charities need year-round. The 100 Cars for Good program began in March of 2011 with nearly 3,000 applicants from around the country. Friends and Operation Food Search survived two cuts along the way to become two of the 500 finalists. The public recognized the hard work and dedication of the organizations, voted, and made them winners! Friends of Kids with Cancer staff, board members, several kids in treatment and their families gathered together at the celebration to thank everyone at Toyota and Seeger... and to check out the new van! "We have such a need for a new van that the engine will not have a chance to cool down!" Said Judy Ciapciak, Executive Director. "Most importantly, our Sienna will be delivering smiles on the faces and hope in the hearts to the patients and families we serve!"